I don't particularly like making muslins of patterns, as is probably the case with most sewists. If I have a pretty good feeling about a pattern, I'll make a wearable muslin instead. I make it out of fabric that is nice enough to be a finished garment if it works out, but not so nice that I'll be upset if I kill it. This blouse is one of those wearable muslins! 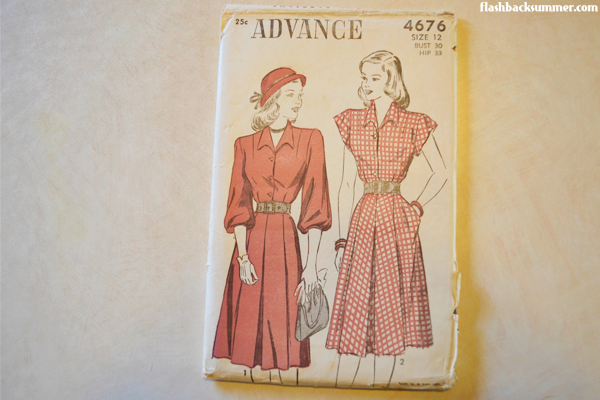 Below is the pattern I used, Advance 4676 from the 1940s. I fell in love with the gorgeous 3/4 length sleeves, but I don't particularly like the skirt (pleats are too much work to re-iron). I decided to turn the bodice into a blouse by extending it and making it longer on the bottom, and for the fabric I used leftovers from my husband's robe I made him. One can never have too many solid colored blouses! I had some issues in cutting it out, and somehow the fabric slipped and the grain is weird on the back... one shoulder ended up slightly longer than the other... 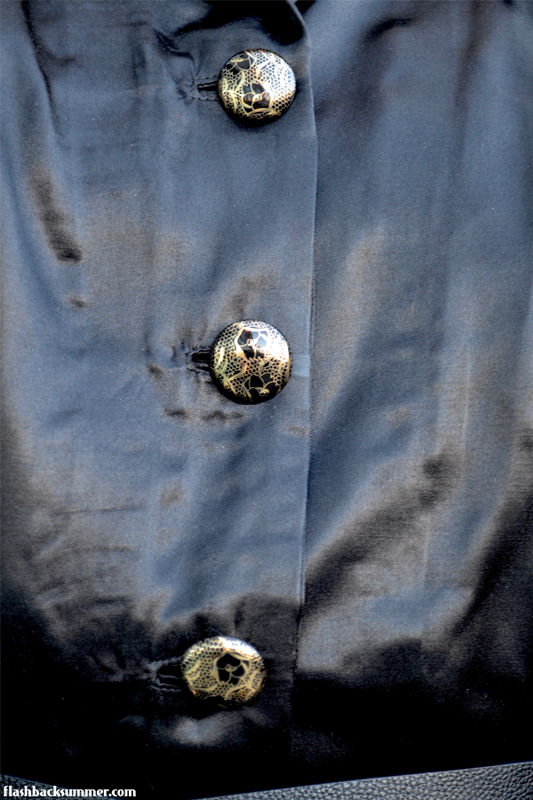 I dunno.... sometimes strange things happen, especially with slickery fabrics like this flannel-backed satin. I decided to roll with it and fix it along the way. You know, it's a muslin, haha! I didn't have extra fabric, so I thought I'd see if I could make it work. Luckily, it turned out at the end! I think next time I'll shorten the sleeves by one or two inches, but besides that, it worked out just fine. This pattern will graduate on to real fabric soon! I paired the top with my favorite baggy pants from Zanzibar and a giant waist belt from F21. The pants can't help but look a bit Middle Eastern because if the similar shape to harem pants, so I rolled with it and made a vaguely Middle Eastern ensemble to go with it. I used a sheer black scarf to make a 40s style turban and topped it with a brooch. I love it! I felt very comfortable in the looser fitting clothing, and adding heels and pops of gold made it feel glamorous at the same time. lip stain: Kat Von D "Outlaw"
shoes: no idea. Won't even lie. I love it. Looks wonderful on ya. Love the pants too. Haha, I have no idea. Cultural sounds good to me! Really interesting and evocative that your outfit! I love it! I know the wearable muslin feeling, especially since I'm a beginner, but I think from the looks of it the blouse turned out beautifully--and actually drapes like the pattern illustration!! Lovely outfit Emileigh. I like the shirt especially the sleeves. I know what you mean about muslins, I hate making them myself, unless I'm making a wearable one. Overall I think you did a good job, love to see your next version. Strikingly chic ensemble! That awesome belt is really ties it all together (pun not really intended). Wishing you and your honey a marvelous Valentine's Day! Fantastic! Love the colors, the contrasts - it's a perfect ensemble. Haha, oh dear! I did something similar for this shirt. I forgot I needed to add some to the bottom hem, since I'm using a dress bodice pattern to make a blouse! I had to cut out some pieces a couple times! This is such an amazing look! It's so refreshing to see vintage done this way. It's very distinctly 40s, but also very distinctly Middle Eastern, and the two styles marry together beautifully. You look beautiful and incredibly striking. Aw, thank you so much Jessica! 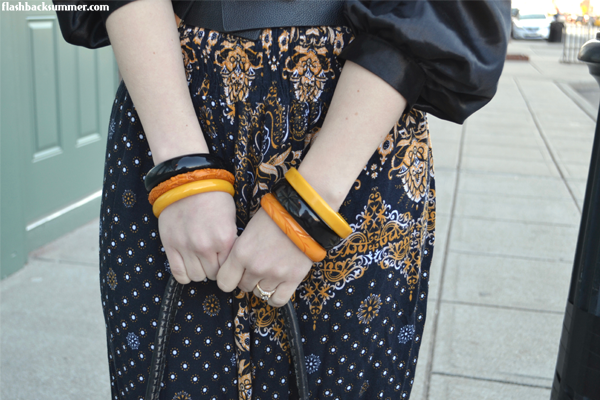 I can't believe how wearable your 'muslin' of this pattern is (the black satin look is heavenly)! I will definitely have to take stock of this idea next time I go to make something that needs a bit of fussing. Ha, well, I usually only do this when I'm pretty confident I can do the pattern. If I'm really unsure how it will fit or go together... I use fabric I REALLY don't care about! This outfit is to die for beautiful!!!! Personally I probably wouldn't go with the shiny satin of the blouse but the cut is really wonderful! Love this look!